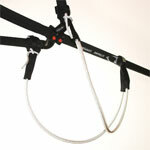 The Kitewing "V" harness line has been designed by our best riders to meet their needs. The double-sided V line stabilizes the wing when hooked in. The V concept makes it possible to jump with one hand or no hands on the wing. The racers appreciate the possibility to use the leeward side of the lines for more power in light winds. The V-line is easily adjustable for different lengths, the maximum lenght of the line is 103cm/ 40,5" with adjustability of 10cm/ 3,9".